Structure your workload with this comprehensive guide to the role and responsibilities of library technicians! More than basic instructions on how to do library classification, this classic work is a how-to handbook covering all aspects of a library technician's job. 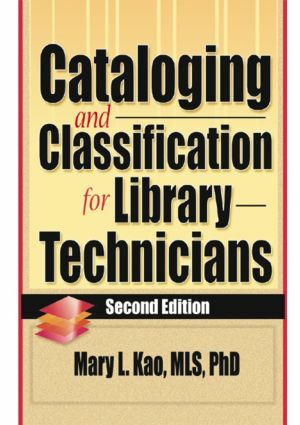 Cataloging and Classification for Library Technicians, Second Edition, gives step-by-step instructions for all aspects of cataloging and classification of library materials (book and non-book), emphasizing copy cataloging but also discussing original cataloging. Because much has changed in the library field since the first edition of this valuable resource was published in 1995, each chapter has been revised and updated, and an entire new chapter has been added to discuss computer cataloging in the MARC format and cataloging of Internet materials. Cataloging and Classification for Library Technicians, Second Edition, interprets and explains cataloging rules and how they should be applied. Kao describes library organization and personnel patterns to illustrate the relationship between library technicians and other library staff. Cataloging and Classification for Library Technicians, Second Edition, is an ideal text to use in programs for library technical assistants and a handy reference for practicing library technicians.